I have received a number of emails on the performance testing of the TrueRNG. Every one of these have ultimately been attributed to a small sample size or incorrect testing. 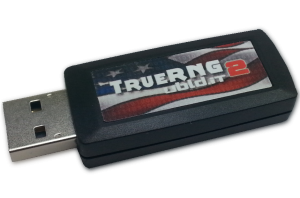 The TrueRNG products generate true random numbers - there is no guaranty that chi-squared or other statistical tests will fall within any given range for a small sample size. The Openoffice Calc spreadsheet is here. Here is the source data. 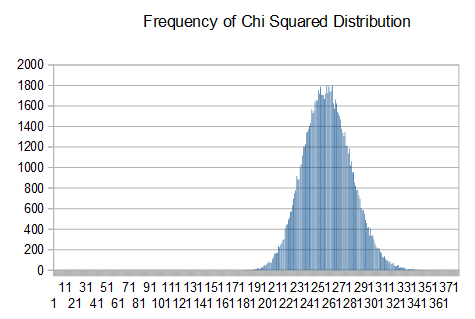 Notice that the chi-squared values follow a normal distribution centered around 256 and that the exceed percent values have a uniform distribution. For a large number of runs, this is the expected result. From this, you can see that taking a small number of tests from a small sample size may give results that 'seem' bad. 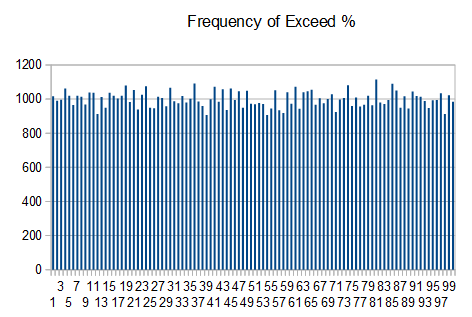 With a perfect generator, it is expected to get percent values < 5 or > 95 in 10% of the results. If you don't see this distribution over a large number of runs, then there may be an issue. It is expected that a true random number generator will fail statistical tests a certain percentage of the time. Notice that there are 5729915 successes and 595 Monobit failures (out of 5734399 runs). For FIPS 140-2, the monobit test is EXPECTED to fail about 1 out of every 9662 runs with a perfect random source. For 5,734,339 runs, we would expect about 593.5 failures which is very close to the actual number of failures of 595. Similarly, a certain number of failures is expected for each of the tests (except for the continuous run obviously). As with other statistical tests for random number generators, it is expected that each dieharder test gets a 'FAILED' result a certain percentage of the time. A single of small number of failures on a particular test is not a cause to label the generator as bad. For a 'FAILED' result, a particular test can be re-ran on the same input file with a larger block size to show that the failure is an anomaly. If there is consistent failure on a particular test using multiple input runs and the test is not suspect, then there may be something wrong with the random number generator or testing methodology. I designed this board to be an easy-to-use way to get connect to WiFi from an Arduino-compatible board. 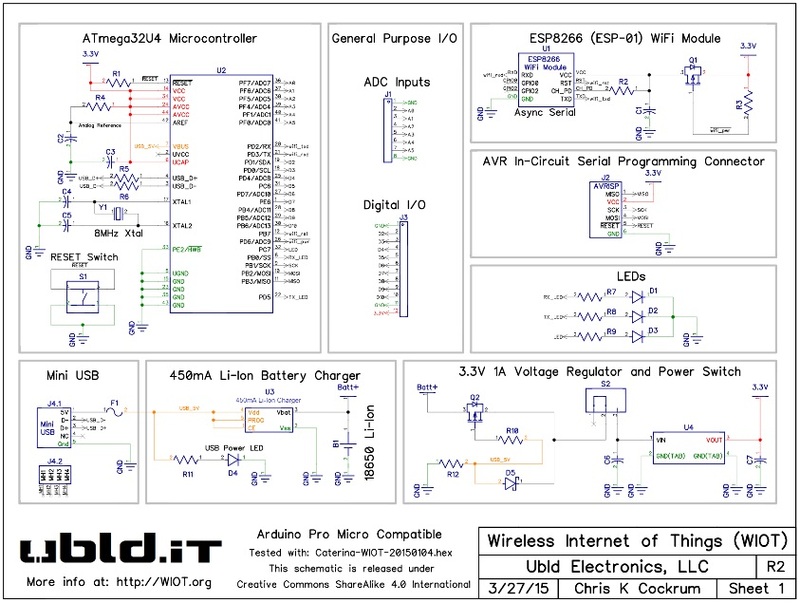 This will allow anyone to write Arduino compatible sketches that can easily use 802.11b WiFi using the ESP-8266 (ESP-01) WiFi module. Although I could have probably done this as a successful Kickstarter campaign, we did the development on our own and ran a first batch of 50 units. If these are popular, we will run a larger batch. One of the problems that we noticed when using other battery powered boards is that even with a low-dropout regulator, the addition of a diode-based power switching circuit limited the power than can be used from the battery. A switching circuit is necessary to keep external power from feeding back into the battery directly which will damage both the battery and charging circuitry. Using a .1V dropout regulator in series with a .25V drop Schottky diode means that for a 3.3V regulator you need 3.65V on the input. Most lithium-ion batteries have a significant amount of capacity left at that voltage that can't be used without the 3.3V sagging. Using our circuit, we can run down to 3.4V without affecting the regulated 3.3V. The 18650 lithium-ion batteries are about 95% discharged at 3.4v. With proper power management and intermittent WiFi usage, the battery can last for days to months (depending on sleep time, WiFi usage, WiFi Transmit usage, and other peripherals) without recharging. On-board switching allows for complete power-down of the ESP-8266. Since the board auto switches between external and battery power, a USB solar	charger may be connected to power the unit indefinitely. The board runs a modified version of the Arduino Caterina bootloader. The bootloader has been modified for this board and to extend the length of time that the board stays in bootloader mode after a reset "double-tap". During development, it was annoying to have to rush to quickly load blink after a failure before the device reset and tried to run code. I tried to get into the Arduino At Heart program but couldn't get any technical cooperation from them. After several emails, they just quit responding to me so I'm releasing the firmware as an "Addon" like several other popular Arduino-compatible boards do. Basically, just unzip the zip file into your Arduino root directory and it should show up as a board in the Arduino IDE. I have tested with the 1.5.8 and 1.6.1 versions of the Arduino IDE. The board comes with a Signed USB .inf file (no crazy stuff to get Windows 7/8/etc working) that uses the standard Windows USB serial driver. Just right-click on the ubld_wiot.inf file and choose install. Your WIOT board should then show up as a windows COM port and be functional in the Arduino IDE. As for Arduino sketches, it works as any other Arduino. Paul King helped me get the WiFi demo sketch working reliably. The firmware in the ESP-8266 can't handle a lot of connections at one time so we have set it up to reset the device in the event of buffer overflow/data loss/other strangeness to make sure that it will still communicate. Here is a video of the WIOT Wifi Demo. It is a simple web server that uses buttons to control LEDs on the WIOT board.